Kamek in Super Mario Party. Kamek (カメック, Kamek) is an antagonist from the Mario and Yoshi universes. 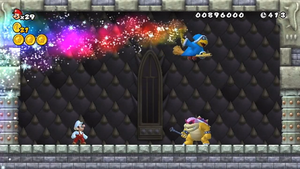 Kamek appears before the boss battle with Roy in New Super Mario Bros. Wii. Kamek is a Magikoopa in Bowser's army. He debuted in Super Mario World 2: Yoshi's Island as Baby Bowser's caretaker and the game's main antagonist: throughout the game, as well as in later Yoshi games, he assist bosses with his magic, usually by making them gigantic. Kamek later went on to appear in the New Super Mario Bros. series starting with New Super Mario Bros. Wii: once again he appears at the beginning of the boss battles to assist the boss, though unlike the Yoshi series in most cases his magic alters the arena instead of the boss itself. Kamek appears as two stickers. Kamek appears as a stage element on the Mushroom Kingdom U stage. When he appears, he casts a spell which switches the stage between its possible forms. He doesn't interact directly with the fighters. Kamek appears as a random event in Smash Tour. He appears at the beginning of a turn and uses his magic to change the position of the checkpoints. Kamek's trophy is part of the Yoshi's Island Trophy Box. Kamek is a magic-wielding, robed figure usually seen riding on a broomstick in the Mario series. He teleports around the stage, looking for fighters. When he finds one, he'll cast spells at them. If he hits you with one, your stats will drop. That's no good, since you'll need some power to deal with Kamek's high stamina! Kamek is a magic-wielding, robed figure usually seen riding on a broomstick in the Mario series. He teleports around the stage, looking for fighters. When he finds one, he'll cast spells at them. If he hits you with one, your stats will drop, which, given that Kamek also has high attack power, is the last thing you need. This magical menace is one of Bowser's henchmen and shows his face in plenty of titles, even outside of the Mario series. In the Mushroom Kingdom U stage, he swoops onto the screen every so often to transform the stage with his magic. Now and then, though, he'll tease you by not casting any magic at all. He's a sly one, that Kamek. Kamek reprises his role in the Mushroom Kingdom U stage. Kamek also appears as a Spirit. Kamek's trophy in the 3DS version depicted him as a Magikoopa, due to Magikoopas being called "Kameks" in Japanese. Unlike Magikoopas that debuted in Super Mario World, Kamek himself debuted in Super Mario World 2: Yoshi's Island. Despite being a Mario trophy in both versions of Super Smash Bros. 4, the Kamek trophy is part of the Yoshi's Island Trophy Box in the Wii U version, which makes sense considering he is Yoshi's arch nemesis. Kamek is the only major antagonist/rival from an Original 8 franchise to not be a playable character. This also means that the Yoshi is the only Original 8 franchises to not have a playable antagonist/rival. This page was last edited on March 28, 2019, at 23:42.